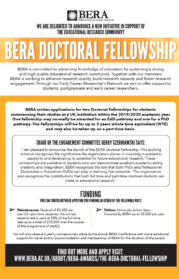 BERA is a membership association and learned society committed to advancing research quality, building research capacity and fostering research engagement. BERA aims to inform the development of policy and practice by promoting the best quality evidence produced by educational research. Members of BERA are eligible for benefits, including events, member networks, research intelligence and access to our journals. We believe that the development of a world-class education system depends on high quality educational research but this is field where policy decisions are often driven by ideology rather than robust evidence. 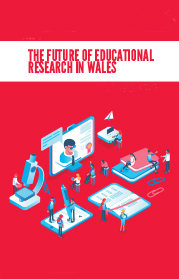 BERA draws on the findings of the best independent and critical studies to evaluate current polices and practices, to generate fresh thinking and to bring a humanising influence to bear on proposals for reform. 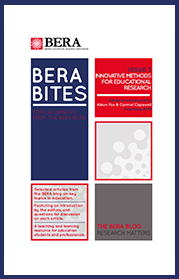 BERA produces a range of publications and other materials aimed at supporting the work of all those who are active in the field of educational research. This includes our four highly regarded peer-reviewed journals, our ethical guidelines, a series of research methods text books for those beginning their research careers, and a range of topic-specific web-only documents. 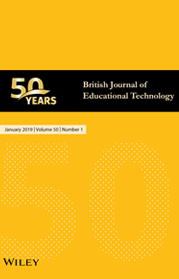 Members also have access the European Educational research Journal. School Readiness: Why and for whom?